Each year, in MicMinnville, Oregon, on the bucolic campus of Linfield College, the International Pinot Noir Celebration offers many remarkable events including the Breakfast and Sparkling Brunch Finale on the Riley Hall Lawn, the Opening Ceremonies where the Master of Ceremonies holds court and all the participating winery representatives are introduced, The Lunch on the Lawn held in The Oak Grove, the University of Pinot classes held in academic classrooms but with no homework or tests, the Alfresco Tastings in the late afternoon at the Dormitory Quad, the Friday night Grand Dinner held on the Intramural Field, and the Saturday evening Northwest Salmon Bake at The Oak Grove. 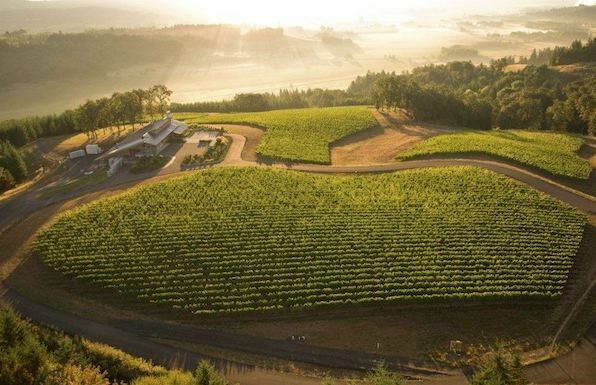 In addition, attendees are loaded on buses either Friday or Saturday (as part of either Group A or Group B) and sent into the surrounding Willamette Valley to visit a hosting winery for a Vineyard Tour, Seminar, and Lunch. The attendees are completely unaware of which winery they are destined for, and which winemakers are accompanying the group to the winery. The highlight of this year’s IPNC for me was the Wine Country Lunch at Penner-Ash Wine Cellars in Newberg, Yamhill County. 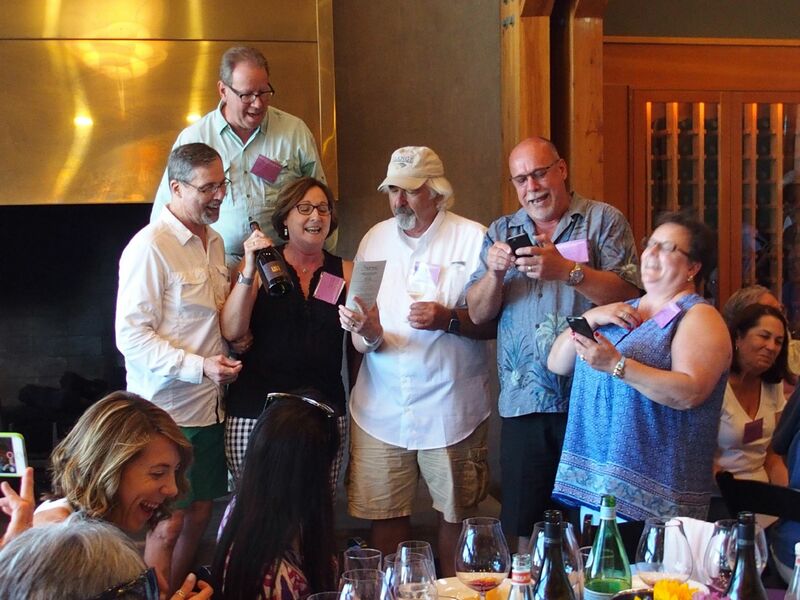 Winemaker Lynn Penner-Ash hosted our group along with winemakers Erik Kramer of Domaine Serene in Dundee, Oregon, David O’Reilly of Owen Roe in Newberg, Oregon, Don Lange of Lange Estate Winery in Dundee, Oregon, and Nathan Kandler of Thomas Fogarty Winery in Portola Valley, California. 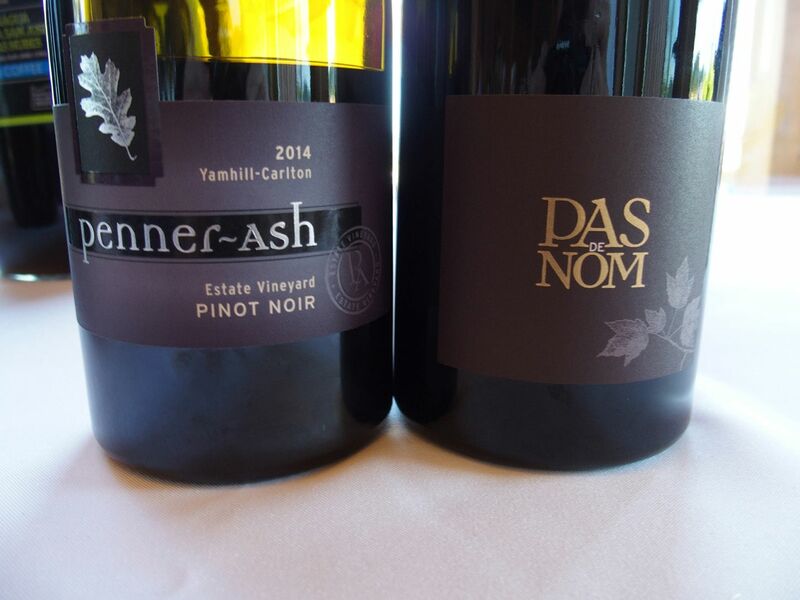 The group was in high spirits after indulging in a number of outstanding Penner-Ash wines that accompanied the memorable lunch prepared by Guest Chef Daisley Gordon of Café Campagne in Seattle, Washington. I have been to many IPNC events through the years, but this was the best lunch I have ever experienced. So grand, that I have thought about traveling to Seattle just to eat at this restaurant. Every course was perfectly matched to the chosen wines which were all superb. Chef Gordon worked in a few restaurants after college and then graduated from The Culinary Institute of American in Hyde Park, New York, that included an internship with a certified Master Chef. In 1995, he landed at Campagne Restaurant, Seattle’s standard-bearer of regional French cuisine. He never left, progressing from sous chef, to chef and eventually chef/partner. At the 20-year-old Café Campagne, he celebrates the bounty of the Pacific Northwest seasons in the French style. After the Poulet au basilic course was served, Lynn had a special treat for our group. In special vintages, her top bottling is named “Pas De Nom,” that translates as “No Name.” It is a limited production Pinot Noir made from several vineyards and priced at $125 (current vintage 2014). Lynn brought out several bottles of the stunning 2008 vintage for our group. The photo below also shows the 2014 Penner-Ash Estate Pinot Noir that was served at lunch. 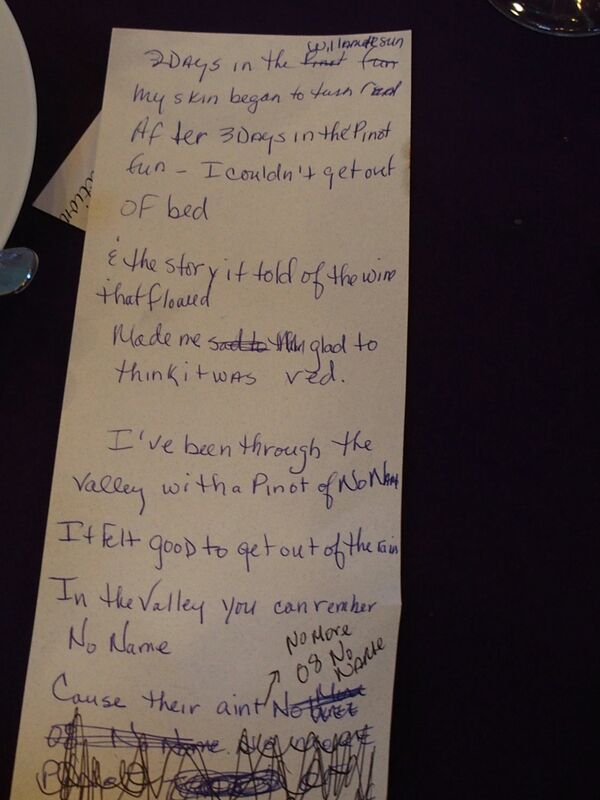 One table got the idea of writing revised lyrics to the well known song, “Horse with No Name,” first recorded by the band America and released in the US in 1972. Although certified gold, the song was banned by some US radio stations because of supposed drug references to heroin use. The band members were said to be intoxicated with cannabis while writing the song and received criticism for the banal, oddly phrased lyrics. Appropriately, our lunch group was intoxicated with Pinot Noir when they wrote these revised lyrics incorporating Pas De Nom in the song lyrics. They were able to coax Don Lange, a well-known folk singer (white cap in center), into joining them as they serenaded Lynn. The result was hilarious since the singers were way off key. The singers and lyrics are pictured below.